This morning I was one of three wise guys to present a short seasonal talk at the Skidaway Island Kiwanis Club. I was honored to share the podium with Pastor Jason Talness of Messiah Lutheran (he’s from Minnesota and a Viking fan) and Rabbi Robert Haas of Mickve Israel (who is also a stand-up comedian). One of the occupational hazards of being a Presbyterian minister is that I cannot stand before a group of people to talk without focusing on a Bible passage. It’s what we do. If I was Baptist, I’d have a supply of water and probably be making an altar call. If I was a Lutheran from Minnesota, I’d probably be touting some made-up virtue of godless-Vikings and suggesting that the significance of the purple color of Advent is deeper than its liturgical meaning. And if I was Jewish, I’d be thanking God for one of those hats, a yamaka, like Rabbi Haas wears. I don’t understand our God. Robert has nearly a full head of hair and has to hide it. Me, well, I’m just trying to figure out how to make such a head covering a part of my religious tradition. The painting I displayed as a backdrop was based on this verse in Scripture. It was one of over a hundred variations of “The Peaceful Kingdom” painted by the 19th Century Pennsylvanian artist Edward Hicks. With so many paintings of the same subject, you’d think he fell into a rut. But he was a Quaker, and in addition to oatmeal, peace is something they do a better job striving for than most of us. Hicks was captivated by this passage. Highlighted in each piece is a child (or in some cases, children) along with the animals depicted in the poetry of the prophet. Often, I think, we hear this passage and think we’re to follow that child. But that’s not the point. 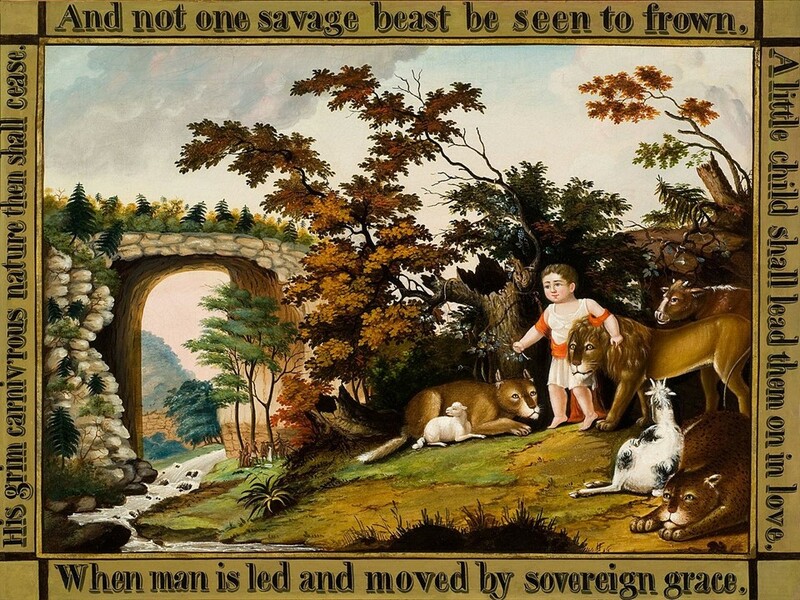 The child in Hicks’ painting as well as the one referred to in Isaiah is leading wild and dangerous animals. In our world, the parents of such a child would be charged with neglect. Who let’s their children play with wild animals? Our world is too violent, too dangerous, as was Isaiah’s. The prophet’s vision, his longing, is for the peaceful kingdom to come about, and that’s something only God can instill. For Christians, we see this beginning with a child born in a manager. We are to follow that child when he’s no longer in swaddling clothes, but crowned in righteousness, as we work to protect children and strive for a peaceful world as envisioned by the prophet. We have our work cut out for us. For Christians, Christmas remains a season for children. My best memories of the season is as a child. I didn’t have to worry about sermons back then. And what few gifts I had to give were homemade and, I can assure you, a parent’s love is greater than a child’s skill. So for a moment, think about the holiday when you were a child. How about that time you bravely climbed up into Santa’s lap and boldly told him you’d been a good boy or girl all year. And remember how the old man in red could still be heard laughing as your mother dragged you out of the store? Or how about your first candlelight service on Christmas Eve, the mystery of the evening and the joy of the music filling the hour. Think about how especially proud you were when you were first able to hold a lighted candle by yourself. I know I thought I’d made the big leagues. And then, because we live in a fallen world, think about how you realized you could tip the candle just right and wax would drop, missing the guard, and plop on your sister’s hand she unsuspectingly rest it on the rail of the pew in front. I don’t know about you. I was married and with kids before my mother trusted me with another candle. My current congregation heard of my sin and took care of this problem by issuing battery powered candles. Think of how excited you were as a child to wake up on Christmas morning and discover the treasures left under a tree. In my family, there were three of us and we’d have to all be ready at the same moment to enter the living room where the loot had been stashed by St. Nick. We never could understand how he managed this since we didn’t have a chimney. And those carefree Christmas Days were special. We’d play with friends and cousins, trying out everyone’s new toys. Early in the afternoon, we’d be called to a feast with an insane amount of food, which none of us were interested because we’d already been into the stuffing (that is the candy stuffed in the stockings Santa left). That child born in Bethlehem serves as an inspiration for those of us who strive to follow him. 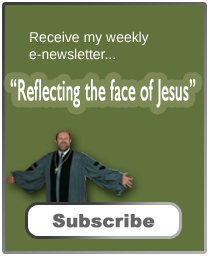 And years later, when he was grown and wandering around the backroads of Galilee, calling the disciples and others to follow, Jesus reminded them (and us) of the importance of childhood. Jesus encourages us to hold on to the awe and innocence of a child, telling us that in order for us to enter the kingdom of Heaven, we must come as one. As Kiwanians, thank you for helping children make and experience such memories. During this season, I encourage you to watch the children and capture some of their excitement. Then, hopefully, you’ll be inspired as Kiwanians to continue the kind of building Kiwanis is known to do with children around the world. Until God ushers in that Peaceful Kingdom, we have work to do. Thank you. wishing you and yours a blessed Christmas and a rewarding New Year!